Where stands the attempt to free our taxation from the clutches of Planned Parenthood pork, now that the two week Continuing Resolution has passed? Will House Leaders Cave on Defunding Planned Parenthood? On February 17 the U.S. House of Representatives passed an amendment sponsored by Rep. Mike Pence (R-Ind.) 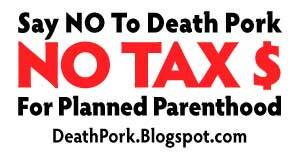 to prohibit federal funding of Planned Parenthood for the remainder of the fiscal year. The amendment was part of a Continuing Resolution to fund the federal government through September 30 and prevent a government shutdown. Although the House passed the full CR, the Senate failed to take it up, necessitating a new CR. This one is slated to keep the government funded for two additional weeks after the current CR runs out on March 4, during which time the House leadership will attempt to negotiate a long-term CR with the Senate and the White House. The question pro-lifers are asking now: Will the Pence amendment survive the CR negotiations? The House vote on the Pence Amendment is nothing more than symbolic unless it remains intact through the legislative process. Defunding Planned Parenthood must be a non-negotiable in the Continuing Resolution and we urge you to accept nothing less than this outcome. This article is very worth reading to its completion. We the People must continue to press Congress, now, again, in both houses, to see this done. And now, both we and our destructive opposition have that opportunity.